Just when it appeared as though construction of the Academic Center would never take off, steel beams went up seemingly overnight. Another academic semester begins at College of Marin, and the school’s seemingly unending “modernization project” continues. For returning students the sight of neon-vested workers in hard hats and the sound of shrill beeping have become part of the campus’ backdrop. These minimal distractions, however, are the price to pay for the 17 state-of-the-art-classrooms that students will be able to enjoy once the new academic center finishes construction. Additionally, once the project is completed, students will no longer need to fear registering for a class potentially taught in one of the portable bungalows. The building is scheduled to be opened for use at the start of the 2015 Summer semester, and at its current stage it is estimated to be 20 percent complete. The former site of Harlan, Olney, the Business and Management Center, and the Administration Building, (top), was cleared to make room for the new Academic Center (above). 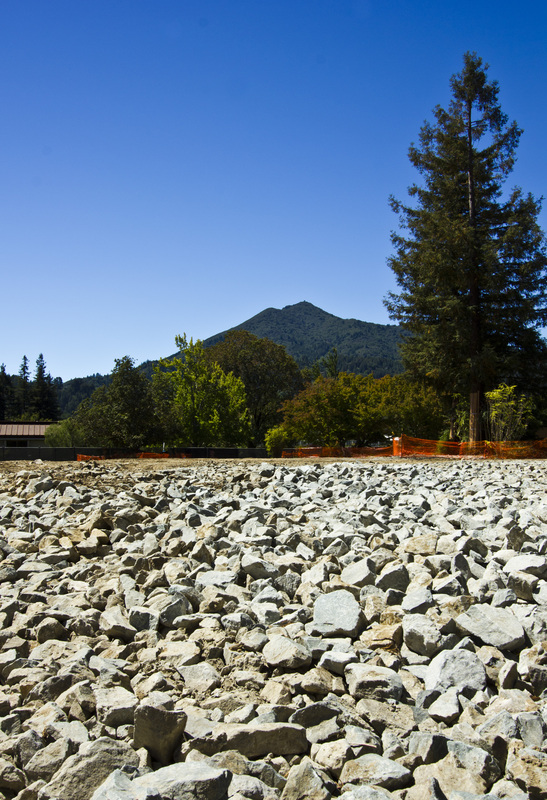 Construction is a continuing theme at College of Marin, as it enters it’s ninth year of the Modernization Project. 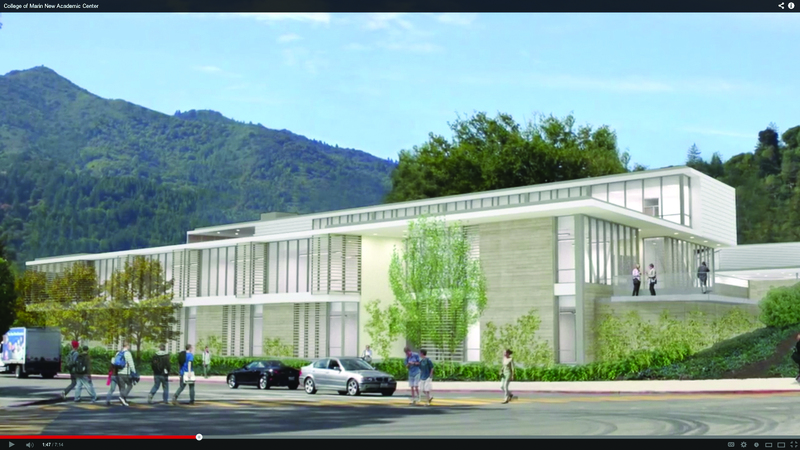 Funded by a $250 million measure C bond acquired in 2004, the modernization project is all about modernizing old classrooms, providing new technology for smart class rooms, and creating a more fire safe campus. 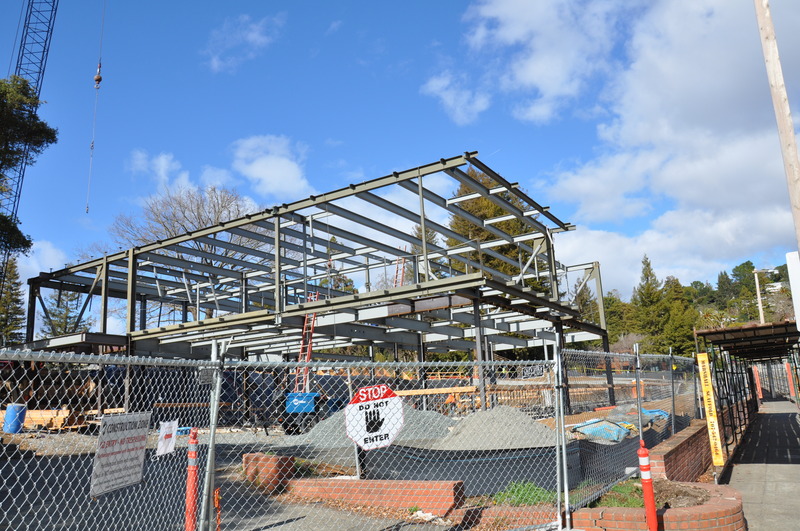 The most recent work done on College of Marin Kentfield campus, since Spring 2013, was the demolition of Olney Hall, Harlan Center, the Business and Management Center, and Taqueria Mexican Grill de Marin. These buildings were demolished to make room for the new Academic Center, which will include new smart classrooms, lab classrooms, and new offices. Although the construction has created short term issues, it is hoped the long term benefits will outweigh the frustration of waiting.